Sabyasachi is one of the most revered names in the Indian fashion industry. This designer has gone where very few mainstream designers had gone before, by choosing rare weaves and handloom heavy fabrics to marry them with an understated yet opulent style of his own. In this, he chooses to market not a label – but an experience; a taste of fashion and what it means to him. 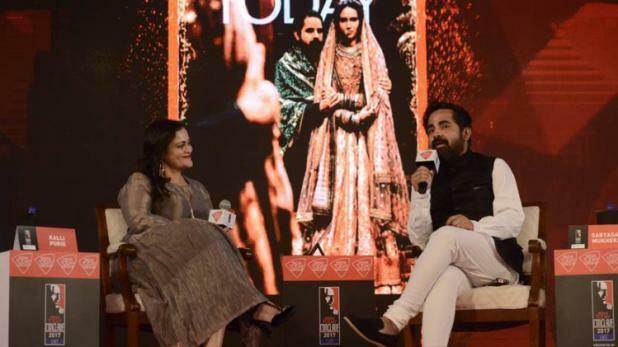 It came as no surprise when the India Today Conclave East organised an entire event called The Sabyasachi Woman. The conclave gave the ace designer the platform to express his notions on style and tell the world what he perceives as a stylish woman. Apart from his ticker breaking statement which has appeared on news channels and social media platforms incessantly, where he said, “Style is about a woman, who is 5’1 and wears flats to a party”, Sabyasachi also made some sweeping statements – just as radical as his line was first thought to be. Yet, there was truth galore in each line he spoke. One of the major things that he spoke about includes the influencer and the follower. This is more relevant than ever today where we readily see a shift at the drop of a hat. He noted how a sorrow was a personal thing, a blingy saree a personal choice. But now a sorrow shared as a status update becomes a talking point for social commentary, and a blingy saree has been replaced with khadi, by the lady desperate to move from luxury to culture. Here, he made another pertinent point on luxury. Sabyasachi went on to tell us how he has separated luxury from subjugation. He never believed that one was born from the other. Yet, now there is a movement towards culture and people are trying to shun luxury in a bid to follow this movement. Why? Luxury to Sabyasachi is the same as pride – completely detached from the width of your wallet. While on the subject of influence, luxury and followers, Sabyasachi has also courted controversy when he dressed Vidya Balan for the Cannes Film Festival. Little did he know at that time that he would be deemed “a national terrorist” because he followed his heart and not the norm. At the click of a button, he explains, there were juvenile fashionistas calling him out for dressing her in a look that was heavily panned for being too ho hum for Cannes. Really? And just what were they expecting – a bling infused number that would show miles of cleavage? If one is to look at the pictures of that red carpet, you will see Vidya Balan holding her own in regal pieces that seemed to dramatise the everyday. And is that not what the movies are all about? At the same time, he also addressed the hypocrisy that comes with it all – a la Deepika Padukone who was heavily trolled for showing her cleavage. Why the “polarisation?” He asks. Where are the in betweens, the ones who play it safe, the ones who stay cool, the ones who keep it classy? Just like his label, drenched in the opulent exotic, as I like to call it. So, that is style to me – being who you are without a care in the world! Fashion is about you, me – everybody. I would readily give up a Kareena in Manish Malhotra for a Kate Middleton who does “commoner” like a true royal ready to capture everybody’s heart! Even if she is dressed in Alexander McQueen. It is about reinventing your back to basics emotion, just like he did with the heritage red collection. 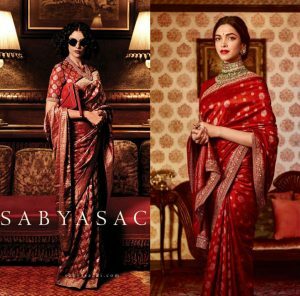 So here are the five Sabyasachi looks we absolutely love! 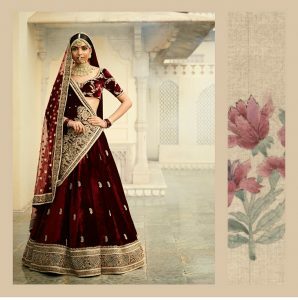 The Sabyasachi bride dipped in the rich burgundy shades of a betel leaf inspired hue. The gold embroidery weaves a subtle magic and the jadau jewellery adds to the aura of the simple Indian bride, wearing a rather regal attitude on her wedding day. This lehenga is a classic that borrows from our grandmothers’ closets which held stories of princesses wrapped in feminine florals coming alive on delicate chiffons. The embroidery brings alive that era for the bride who likes to keep it subtle, while the oversized border adds the necessary drama. 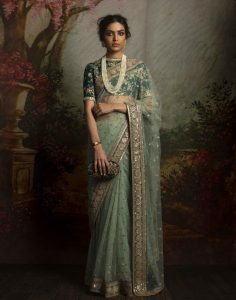 The barely there mint hue of this saree is as fresh as a bud caressed between the pages of a romantic, page worn novel. The pretty border adds a certain finesse while the boat necked blouse in dark green and brocade detailing makes a jewelled appearance. And as if the impact of this look was not enough, the ensemble is swathed in luxurious pearls and a simple watch on the wrist. 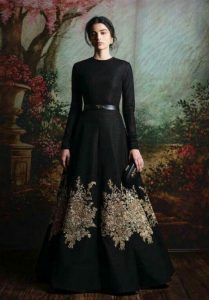 A classic waist cinched with a glossy belt and larger than life florals meticulously embroidered in hues of gold on the dark as night black gown. This is the stuff of Medieval romances happening atop the Orient Express; in search of the silk route with the mysterious European mountains receding in the backdrop and a twilight sky overhead. The long sleeves and the simple cut that flares out as if too scared to spill the secrets of the heart, makes this one a winner all the way. Deepika in Sabyasachi Heritage Red, draped in Benarasi finery, and head turning red lips. Need we say more?